I was recently introduced to zentangles, and I have been having so much fun with them. I’ve been experimenting with different papers, pens, themes, and ideas. I recently read an eulogy of a renowned woman equine veterinarian who was also a trained concert pianist, an avid reader, well travelled, and active with friends and family. Her interests were wide, and the author of the eulogy spoke about how this woman was a true example of one who understood how to exercise true balance in her life. Almost simultaneously I read a blog entry by an author who recently had open heart surgery. He reminisced about his early years when he put in 14 hour work days, and expressed his regret for taking so long to understand and embrace balance in his life. He spoke of open heart surgery being a wakeup call of sorts, and he is now awake and listening — truly understanding what is truly important in life. 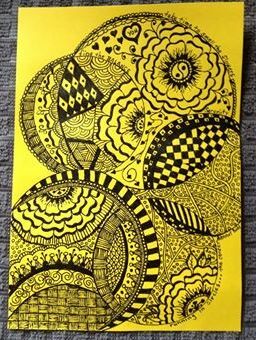 So I began to reflect on balance in life, and this zentangle was the result. Starting at the base it is obvious that attempts are made at stopping to smell the flowers and understand what is really important, but it is surrounded by chaos and stress. . . running in circles. It takes time to learn, and it is an upward climb. The lines from Yeats’ poem came to mind as I was creating this, working my way through a spinning quagmire. Balance is all about being centered, and one phrase in the poem says, “The centre cannot hold.” Obsessive focus on any one aspect of life certainly knocks one off kilter and makes it impossible to attain the serenity and harmony of a soul in balance. By the time the viewer reaches the top of the zentangle, the whole concept becomes very clear. NOTE: Zentangles are essentially doodling. This is entirely done by hand, and I estimate it took me about 3.5 hours to complete.